Absolutely THRILLED with this wig! Prowig was very easy to work with and fast at communicating and shipping. It looks awesome, just like the picture. Packaged will and color/style is exceptionally beautiful. The bangs are gorgeous. Will definitely be ordering more. Thank YOU! Certainly transforms my hair from a drab ponytail into looking like I have spent hours in the salon. I am happy with the colour. Love this wig it is of beautiful quality. The wig hold very firmly. There is a large space for you hair to fit under, so even people with long hair would be able to use this wig. The one I received doesn't look like the one pictured, it is a little fancier. It is fabulous! For a night out or a quick run to the mall when you don't have time to fuss, this is the piece to have in your collection! I purchased this one about a month ago and have worn it several times. The colour is a perfect! I have had strangers stop me to compliment me on how lovely and perfect my hair looks! I love the style, I never style it, just a simple shake and it's good to go. I was a little disappointed with my most recent purchase from wigshow, because the hair seems a little thin out of my expectation. 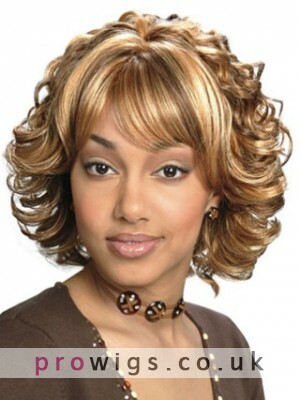 But I love the style of the wig and wigshow did have the best price out there!